Analysis of gaseous species by quadrupole mass spectrometry involves ionisation of the molecular species most typically by the electron bombardment technique, the ionisation process creating fragmentation ions additionally to the parent ion. Spectral interpretation can then be compromised by spectral interference in some gaseous mixtures. Hiden Analytical introduce the APSI(Appearance Potential Soft Ionisation) mode to their full range of gas analysis systems to enable reduction of the fragmentation ion effect for many species, resulting in enhanced spectral purity to simplify spectral interpretation. Each molecular species has a specific ionisation energy threshold at which the parent ion is formed, higher electron energy then generating fragmentation of the ion. 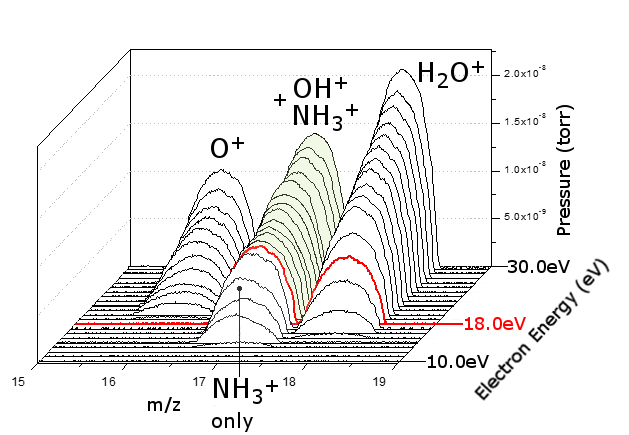 The Hiden APSI mode enables the user to set discreet ion energies from as low as 4eV for each individual mass channel to selectively identify parent ions and to minimise generation of fragmentation ions. Application examples include identification of deuterium in helium(both at m/z 4), ammonia in the presence of water vapour(suppression of the OH+ ion at m/z 17), part-per-million water levels in argon(suppression of argon isotope ion 36A++ at m/z 18). The 3D profile scan presentation displays selected multiple mass channels with peak intensity v. electron energy to rapidly establish the beneficial and individual energy levels for each selected mass channel.